If you have a history of calcium oxalate kidney stones or kidney disease, you may need to limit oxalate consumption. Plants naturally contain oxalic acid, so if you eat a balanced diet that includes fruits, vegetables, beans and nuts, you also consume oxalic acid, or oxalate. For most people, this isn't a problem because it's eliminated through urine. Those on a low-oxalate diet may choose from a variety of fruits that are low in oxalate. More than 90 percent of the oxalic acid you consume is excreted in your urine, according to the Oxalosis and Hyperoxaluria Foundation. The potential problem arises when oxalic acid encounters calcium in your kidneys, because they can combine and crystallize to form calcium oxalate kidney stones. If you've had calcium oxalate kidney stones, reducing the amount of oxalate in your diet may prevent stones from forming. You may also need to limit dietary oxalate if you have kidney disease or a rare disease called primary hyperoxaluria. Whether you should restrict oxalate depends on your individual needs, so consult a nutritionist to determine the best diet for your condition. Very few fruits contain so much oxalic acid that you need to avoid them when you're following a low-oxalate diet. The ones you should pass by in the produce section include dried apricots, figs, kiwi fruit, plums, red currants and rhubarb, according to New York University Langone Medical Center, or NYU. The Oxalosis and Hyperoxaluria Foundation, or OHF, defines high-oxalate fruits as those with 26 to 99 milligrams of oxalate in a 1/2-cup serving. To stick with a low-oxalate diet you should consume no more than 50 milligrams of total oxalate daily, according to NYU. However, OHF suggests staying under 80 milligrams daily. Fruits that contain 10 to 25 milligrams of oxalates per 1/2-cup serving are moderate sources of oxalate, according to the OHF. If you're limiting oxalate to prevent kidney stones, you may be able to enjoy fruits in this category as long as you consume at least 200 milligrams of calcium at each meal and drink plenty of fluids. Moderate-oxalate fruits include blackberries, blueberries, prunes, mangoes, mandarin oranges and fruit cocktail. New York University also adds black currants, sour cherries and purple plums to this list. Most people with calcium oxalate stones can tolerate low-oxalate fruits, as long as they consume calcium at each meal and don't skimp on fluids, according to the OHF. You can enjoy apples, fresh apricots, bananas, sweet cherries, grapes, melons, papaya, pineapples, tangerines and nectarines, according to OHF and NYU. OHF adds raisins and raspberries to the list, while NYU also includes grapefruit, oranges, peaches and pears. 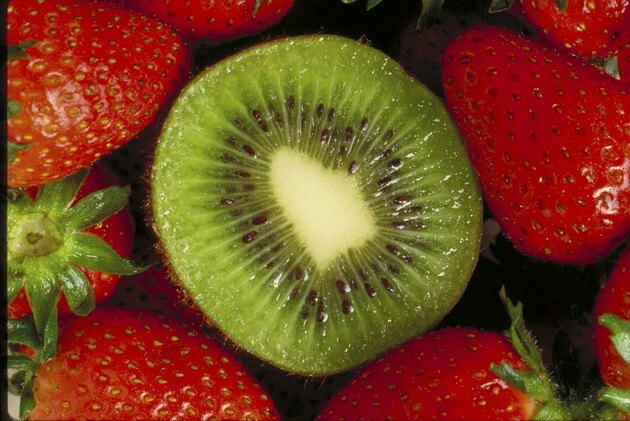 Frozen strawberries are moderate sources of oxalate, while both OHF and NYU agree that fresh strawberries are low-oxalate fruits. The University of Wisconsin-Madison, however, recommends eliminating strawberries because they increase the amount of oxalate in your urine.